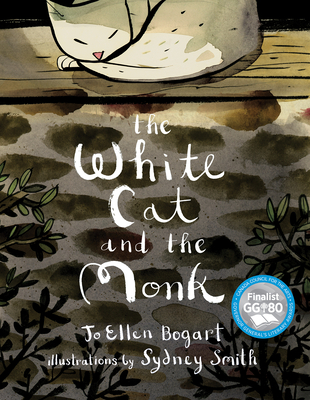 The White Cat and the Monk is a retelling of the classic Old Irish poem "Pangur Ban." With Jo Ellen Bogart's simple and elegant narration and Sydney's Smith's classically inspired images, this contemplative story pays tribute to the wisdom of animals and the wonders of the natural world. Jo Ellen Bogart was born in Houston, Texas, and received degrees in elementary education and psychology from the University of Texas in Austin. Her best-selling children's books have been nominated for and won many different awards, including the Ruth Schwartz Award, the Mr. Christie's Book Award, the Amelia Frances Howard-Gibbon Award. Her picture book Gifts was selected for the TD Grade One Book Giveaway program, as well as the IBBY Honor List. She lives in Guelph, Ontario. Sydney Smith was born in rural Nova Scotia, and has been drawing since an early age. Since graduating from NSCAD University, he has illustrated multiple children's books, including the wordless picture book Sidewalk Flowers, and he has received awards for his illustrations, including the Lillian Shepherd Memorial Award for Excellence in Illustration. He now lives in Toronto and works in a shared studio space in Chinatown and goes to the library or the Art Gallery of Ontario on his breaks.